These crispy eggplant sticks are inspired by from the ones served at Galatoire's in New Orleans, a haven of fine New Orleans dining. The powdered sugar garnish may sound odd, but it's also totally delicious. 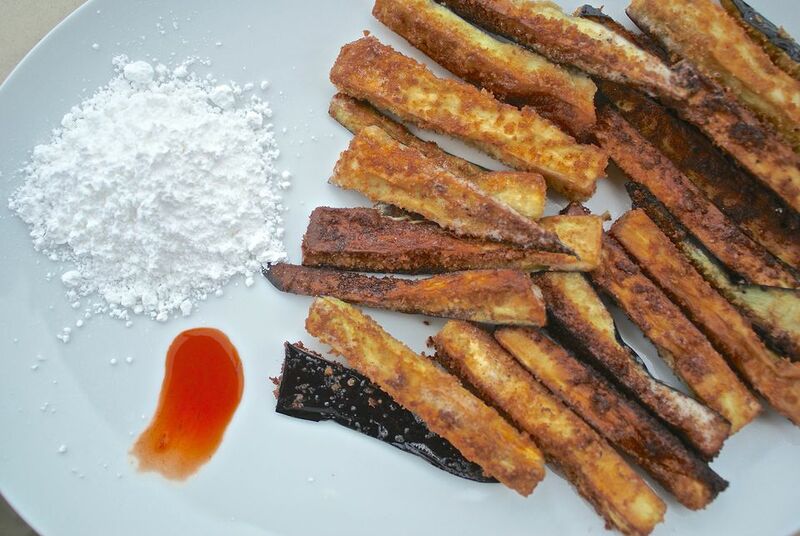 A drop of pungent hot sauce and a dusting of sweet powdered sugar brings out the earthy flavor of the eggplant. Try these and you may understand why historically (we're talking 1800s and earlier), people commonly sweetened their veggies. A note on brining eggplant: Many recipes call for salting eggplant to draw out any bitterness (older eggplants will be more bitter than younger, fresher versions). By brining the sticks, that is, soaking them in salty water for a bit, you both draw out the bitterness and help the eggplant keep its shape while cooking. Trim the eggplants, discarding the stem ends. Cut the eggplants into 1/2-inch wide strips. You can peel them if you like. Dissolve 2 tablespoons of the salt in a large bowl of water. Brine the eggplant in the salt water for 30 minutes. Use a pot lid or plate that fits inside the rim of the bowl to help keep the eggplant submerged under the brine. Meanwhile, set up your breading station. Put the flour and the remaining 1/2 teaspoon salt in a large bowl or a large plastic bag and combine. Whisk the eggs with 2 tablespoons of water in a large bowl. Put the breadcrumbs or Japanese breadcrumbs in another large bowl or a large plastic bag. Set them on a counter or other workspace in that order. Heat 1/2 inch of oil in a large pot or wide and deep frying pan to 375 F. If you don't have a thermometer, use the handle of a wooden spoon to gauge the temperature of the oil: insert it in the oil; the oil should quickly bubble up around the handle, if it doesn't, the oil isn't hot enough, if it bubbles immediately and violently, it is too hot. Drain the eggplant and dry thoroughly with paper towels or a clean kitchen towel. Put the eggplant in the flour. Toss it to coat the sticks thoroughly. Lift the sticks out of the flour and gently tapping off any excess flour. Put the floured eggplant in the egg mixture. Toss until all the eggplant is fully coated. Lift batches out, letting any excess egg drip off the eggplant, and place them in the bread crumbs, Close the plastic bag and move the eggplant around in the crumbs, until each eggplant stick is well coated with crumbs. Fry the eggplant in batches (don't crowd the pan) until brown on all sides, about 4 minutes per batch. Drain the eggplant on a cooling rack or on layers of paper towels. Serve warm with Tabasco and/or powdered sugar.